Art and Politics – Madisonian: Essays on law, leadership, culture, and technology. One question I keep getting asked – and I’m increasingly unsure of the answer – is why we don’t see more litigation or threats of litigation when popular fiction authors utilize fictional versions of real-life celebrities in their books. One example that springs to mind is “Old School” by Tobias Wolff in which the author creates a central role in the narrative for fictional versions of writers including Robert Frost, Ayn Rand and Ernest Hemingway. But I’m sure there are plenty of other examples. Even Michael Cunningham’s Pulitzer-Prize winning novel “The Hours” presents a fictional version of Virginia Woolf. There must be cases in which the subjects of these books – or their estates – could claim in either defamation or right of publicity and yet there is little litigation that seems to arise. When I read these books, I tend to look carefully at the front matter to see if it contains disclaimers or if permissions have been sought to use likenesses of real people, and often nothing is actually printed in the book to this effect, although that doesn’t mean the lawyers didn’t negotiate something up front. Does anyone know if that’s what usually happens or if publishing houses have their lawyers vet the content prior to publication to ensure that there aren’t grounds for any legal action either because the substance of the book isn’t defamatory or because the subject in question would not be entitled to bring a cause of action on jurisdictional or other grounds? Thinking more about the Apple e-book litigation, I couldn’t help but feel a little sympathetic to the book publishers who, at least on a first read of the facts, didn’t seem to have the first clue how to deal with Amazon or Apple when e-book readers started taking off commercially. I wonder if part of the problem for the publishing industry was that prior to digitization (and the release of the Kindle in particular), the only distribution model the publishers had ever dealt with was the sale of paper-based books to retailers for on-sale to customers. They had never had to deal with “device manufacturers” before. This was not the same for the movie, music and to some extent video game industry who had always had to deal in some way with consumer devices that enabled enjoyment of their content – either by manufacturing and distributing the devices themselves (like some of the early video game consoles) or by contracting with manufacturers of devices like music and movie players. Where there was failure to contract, there was litigation – but that happened much earlier in the day (think player piano and Betamax video recorders). So digitization brought with it not only the threat of digital piracy for the publishing industry (a threat faced by all other digitizing industries) but also the specter of having to deal with consumer devices for the first time (Kindles, iPads, Nooks etc). Does this explain why the publishing industry struggled so much to get digital sales models to work, and why they still haven’t been particularly successful at least in contrast to other digitized industries? Or am I way off base here? 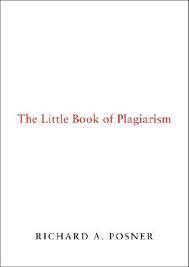 I’m probably late to the party in noticing Richard Posner’s book on plagiarism that was originally published in 2007, but it was an interesting read. I do have a bone to pick with calling it a “book” or even a “little book” as it’s not much longer than a law review article and you can read it in an hour or two, but it was a fun hour or two on my part. Posner doesn’t answer many of the questions he raises about the nature of plagiarism, why it is considered a wrong, when it might not be a wrong, what are the appropriate sanctions etc. However, he raises great issues worth musing about, and it’s a great survey of the different contexts in which we see conduct that may be described as plagiarism – including academia, judicial opinion writing, commercial fiction, historical literature, and art. While he talks about the significance of digital technology both in enabling plagiarism and in identifying instances of plagiarism, he doesn’t come to any meaningful conclusions about whether plagiarism is qualitatively “different” in the digital world. However, he does look at how different economic models of literary production over the years impact on concepts of the wrongfulness of plagiarism over time. So if anyone is interested in thinking about the broad strokes of plagiarsm, the contexts in which it arises and how it differs from copyright infringement and fraud – and sometimes doesn’t differ that much in practice – this is an interesting read. The March 2013 Scientific American contains an interesting article about the origins of human creativity. Archaeologists have discovered evidence of human ingenuity in making tools and art 50,000 years earlier than originally believed. It’s also interesting from the intellectual property perspective to be reminded of how the evolution of science and art are so inextricably intertwined.